If the First Act is setup, then the First Plot Point is the point of no return in character arcs. The setup ends, and the story begins “for realz.” At this point the character commits—usually because he has no choice—to a decision that will propel him out of the comfortable stagnation of the Normal World and the Lie He Believes. The First Plot Point either incorporates or is directly followed by the character’s decision to react in a strong and irrevocable way. The First Plot Point will usually be a major scene. In a thriller or action story, something’s going to explode. In a romance, this may be where the leads meet for the first time—or where they decide they hate each other for the first time. Whatever event your story demands, take advantage of the opportunity to make this one of the story’s most exciting and memorable sequences. The First Plot Point will almost always be forced upon your character. Something big and unforeseen smacks him upside the head. It could be something that seems pretty good: graduating (Orson Scott Card’s Ender’s Game), digging an escape tunnel (John Sturges’s The Great Escape), discovering a princess in your bedroom (William Wyler’s Roman Holiday). But likely it will be disastrous: a murder (Ridley Scott’s Gladiator), a nervous breakdown (Jon Turteltaub’s The Kid), a dashing of dreams (Frank Capra’s It’s a Wonderful Life). Your First Plot Point needs to be preceded by a strong decision on your character’s part (Dorothy Gale decides to run away from home; Jane Eyre decides to hire out as a governess), but the plot point itself is almost always something that upends the character’s plans (landing in Oz; meeting Rochester). This decision leads the character to the First Plot Point, but the decision itself isn’t the plot point. plantation in Roland Emmerich’s The Patriot) or it warps the Normal World, forcing the protagonist to adapt to new ways of surviving within it (the death of Uncle Ben in Sam Raimi’s Spider-Man). The most important thing about the First Plot Point is your character’s reaction to it. If he just stands there observing, then turns and goes back to his old life, there can be no story. The First Plot Point sets up the series of reactions that will occupy your character for the next quarter of the book, up until the Midpoint. As such, the First Plot Point has to cause one very specific initial reaction. Basically, this is just your character’s decision to react. It’s his decision to go ahead and unlock the door to the Second Act. He doesn’t turn away from the First Plot Point–he moves into it. 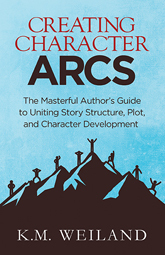 Your character will have two basic responses to the First Plot Point. Either he’ll be, “Heck, yeah!” And charge right on through that door—with no clear idea of what he’s really getting himself into. Or he’ll be kicking and screaming as events beyond his control drag him through. Either way, what’s important at this point is that the character quickly establishes a clear physical goal—based on the Thing He Wants. Usually, this goal will be very clear based on whatever’s just happened to him at the First Plot Point. Physically, he’ll have immediate needs that must be met, either in an effort to find a new “normal” to replace the old one (as will always be the case when the First Plot Point moves the character to a new setting) and/or in an effort to restore the old normal. This new plot goal will be an obvious progression of the events in the First Act, but this is the moment where the goal fully solidifies. This plot goal will propel your conflict for the rest of the story, until your character either achieves it in the end or decides it was the wrong goal (in which case, he may or may not still physically achieve it). Just as importantly, this definitive reaction to the First Plot Point will shape your character’s arc. You know you’ve found the right First Plot Point when it drags your character out his former complacency and puts his feet on the path toward destroying his Lie—even though he probably won’t realize that’s what happening and, indeed, may be actively fighting that destination. Whether he realizes it or not, he has committed himself to change, even though he may still be trying to change in the wrong way. From here on out, whenever he retreats into his fears, he’ll receive negative consequences. A Christmas Carol by Charles Dickens: The First Plot Point howls, uninvited, into Scrooge’s life when the first of the three ghosts arrives. The Ghost of Christmas Past shows up in Scrooge’s bedroom, forever changing Scrooge’s perception of the world. Even if the ghost should disappear, Scrooge’s Normal World has been shaken. But the ghost doesn’t disappear. Rather, it drags Scrooge through the gate at the end of the First Act. It forces Scrooge to begin the Second Act with the new plot goal of learning all he can about his own life and the Spirit of Christmas—even though he doesn’t fully realize it yet. In the beginning, all he wants to do is survive the night, but he’s already passed his point of no return: he can never go back his Normal World. The world itself hasn’t changed, but he has. Cars directed by John Lasseter: The Thing Lightning McQueen Wants (the Piston Cup) is dragged out of his immediate reach when he is accidentally marooned—and arrested—in the forgotten rural town of Radiator Springs. If he’d had his way, he would never have ventured out of his glittering Normal World, and his immediate reaction to the First Plot Point is to form the plot goal of getting his bumper back to Normal as fast as he can rev his engine. But in this new world, all the rules are different. The Lie-spawned behavior he’s been liberally rewarded for previously gets him into deeper and deeper trouble in Radiator Springs. 1. What major event will slam into your character’s Normal World and force him to alter his original plans? 2. What decision will lead your protagonist to the First Plot Point? 3. Will the First Plot Point seem favorable? If so, how will the complications turn out to be worse than the protagonist expected? 4. Or will this event be obviously disastrous? 5. Will the protagonist willingly embrace the First Plot Point and walk into the Second Act under his own power? 6. Or will he have to be dragged, kicking and screaming, through the gateway between acts? 7. Will the First Plot Point destroy the Normal World? Or will it physically remove your character from the Normal World? Or will it warp the Normal World around the protagonist? 8. How will your character react to the First Plot Point? 9. What new plot goal will the character form in response to the First Plot Point? 10. How will the First Plot Point put your character’s feet on the path to his new Truth? 11. How will the First Plot Point create a new world in which the character will be “punished” for acting according to his Lie? The First Act is about setting up your character’s Lie. From the First Plot Point on, that Lie’s days are numbered. From here on out, the story is about destroying the Lie and helping the character find the Truth that will allow him to combat the external conflict and grow into a whole person. Plan a First Plot Point that will tear away your character’s safety nets and force him to step out into the biggest adventure of his life!